Olivia Aberdeen, destitute widow of a murdered carpetbagger, gratefully accepts an invitation from 'Aunt' Elizabeth Harding, mistress of Belle Meade Plantation and the dearest friend of Olivia's late mother. Expecting to be the Harding's housekeeper, Olivia is disillusioned once again when she learns the real reason why Elizabeth's husband, Confederate General William Giles Harding, agreed to her coming. Caring for an ill Aunt Elizabeth, Olivia is caught off guard by her feelings for Ridley Adam Cooper, a southern-born son who---unbeknownst to her and everyone else---fought for the Union. Determined to learn 'the gift' that Belle Meade's head horse trainer, Bob Green, possesses, Ridley is a man desperate to end the war still raging inside him while harboring secrets that threaten his life. As Ridley seeks to make peace within himself for 'betraying' the South he loved, Olivia is determined to never be betrayed again... Set within the remarkable history of Nashville's historic Belle Meade Plantation, comes a story about enslavement and freedom, arrogance and humility, and the power of love to heal even the deepest of wounds. 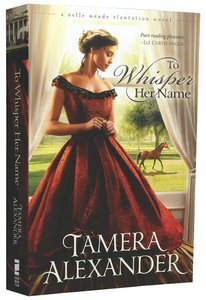 About "To Whisper Her Name (#01 in A Belle Meade Plantation Series)"
Customer Reviews For "To Whisper Her Name (#01 in A Belle Meade Plantation Series)"
The Author takes you back in time (1860) to a time when people were struggling of the post war in America. The story includes some accurate historical events, which makes it a great historical novel with detailed characters. The story is wonderfully written and keeps you interested from the beginning and includes a bit of humour, romance, heartache and compassion. Tamera's writing is just what I love about historical fiction. The stories are slower, but drawn with such detail that you slip into the past without even realising it. There are layers of intrigue woven into this story that also made it compelling to read. Ridley Cooper is just the kind of arrogant rouge a lady like Olivia Aberdeen should avoid. But does she? Of course not. We see Olivia grow in confidence and see her tenacity for propriety unshackled and redirected to more daring and exciting endeavours. I love stories like these where historical events form the backdrop and shape the characters and their world. Olivia and Ridley's romance is a sweet, slow building tale and they are the perfect compliment to each other. A lovely read. Because Tamera is a wonderful author, when this book came out I was expecting it to be better and was a little disappointed with it. Now after rereading it, I have found that it is a wonderful book, if you don't judge it against  the other books Tamera wrote. Tamera Alexander has produced another beautiful tale set in the troubled post-civil-war Southern states of America. She looks at the very depth of what it means to have been a traitor to the South during the war, when those choices had been made because of compassion for the slaves. Great story of courage and romance. Order now to secure your copy when our stock arrives. Other edition is available. 9780310291084 0 Available. Expected to ship in 7 to 8 weeks from Australia.